The Wachowskis are swinging a whole bunch of sledgehammers here. There is the ‘humans are destroying the planet’ hammer, the ‘soylent green is people’ hammer, the ‘meat is murder’ hammer (which are two sides of the same coin), and the faithful will surely object to how the film openly mocks anyone who thinks that we are the only people in the solar system. (We’ll call that the ‘ha ha you believe in God’ hammer.) Heck, one could argue that Caine’s character, a blend of human and wolf DNA created in a lab, is a sack of hammers on its own. It is rare for a plot to be so judgmental, and on so many levels. You almost have to hand it to them. But don’t, because this movie is an unholy mess. The political motivations of the three surviving members of the Abrasax family (whose name is a Santana album title, with two letters interchanged) are never properly explained, while Eddie Redmayne’s Oscar campaign for his brilliant work in “The Theory of Everything” takes a huge hit thanks to his god-awful performance here as the conniving Balem. He spends most of the movie rasping his words like Steve Carrell in “Foxcatcher,” only to explode for no reason at random intervals. (Seriously, he will lose votes because of his work here.) There is also a sequence so goofy that it appears that Terry Gilliam has taken over as director, and that sequence ends with, yep, Terry Gilliam on screen, so maybe he did actually take the reins for that bit. Kunis and Tatum’s chemistry, meanwhile, is a nonstarter from the very beginning, and Sean Bean is in this movie. Do you think we can trust him? 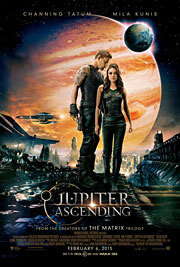 It all looks pretty, and the battle sequences are coherently assembled (though it angers me when filmmakers treat the Chicago skyline so disrespectfully), but “Jupiter Ascending” is only slightly less absurd than “Moon Quake Lake,” the fake movie within the recent remake of “Annie” (which, no joke, is better than you think). The difference is that “Moon Quake Lake” was trying to be ridiculous. 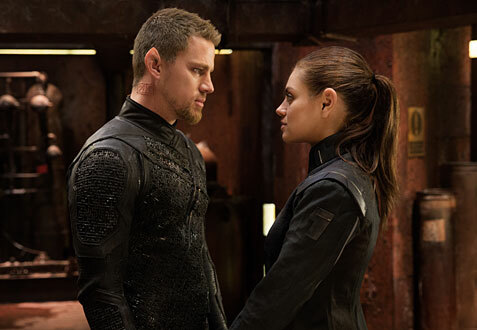 “Jupiter Ascending” isn’t.